Besides my Christmas cards, I also like to make my own gift card holders. Gift cards are great, but I like to make a special card or holder for them. I even made my own envelope for the gift card! 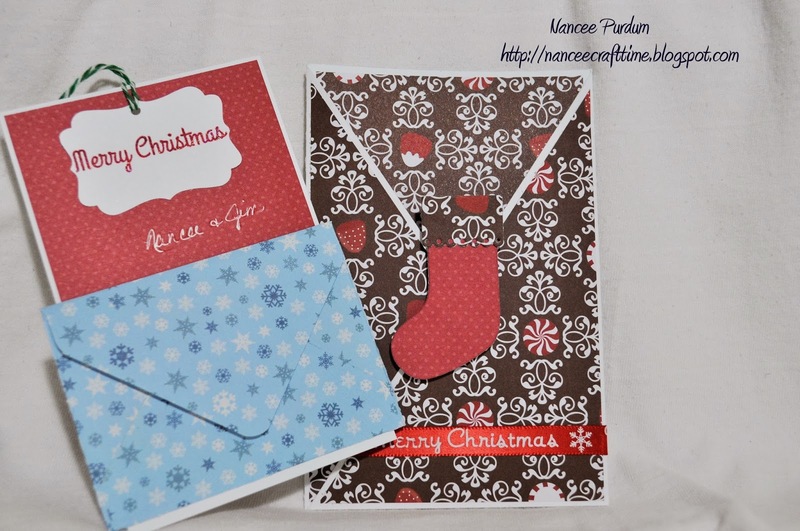 I used my Envelope punch board to make the gift card envelope. I must admit that I did change up the dimensions of the paper and the scoring to make a better fitting envelope. The one shown on the punch board seemed a little big for me (a lot of space at the top). After several trials and errors (LOL! ), I found the perfect size. Not too big at the top! I cut my paper at 5 1/8 by 5 1/8 and started the punch and scoring at 2 1/8. This worked perfectly. I didn’t figure this out until I had almost all of my cards made! LOL! Oh well, at least I have it figured out for next year! My paper is from Recollections, Christmas. This pad has so many pretty and co-ordinating Christmas papers. I used the Memory Box Eyelet Stocking and cut it out of the same papers. The ribbon is from my stash. And another look with the card inside. . . . . . . . .
Time to get started on birthday, Valentine, and baby cards! Oh, this is so cute, Nancee. Love the stocking die. Gorgeous papers and criss-cross card design. I'm like you… I like to make everything! I'm not sure I will make as much next year though. Maybe just for the ones that keep them! 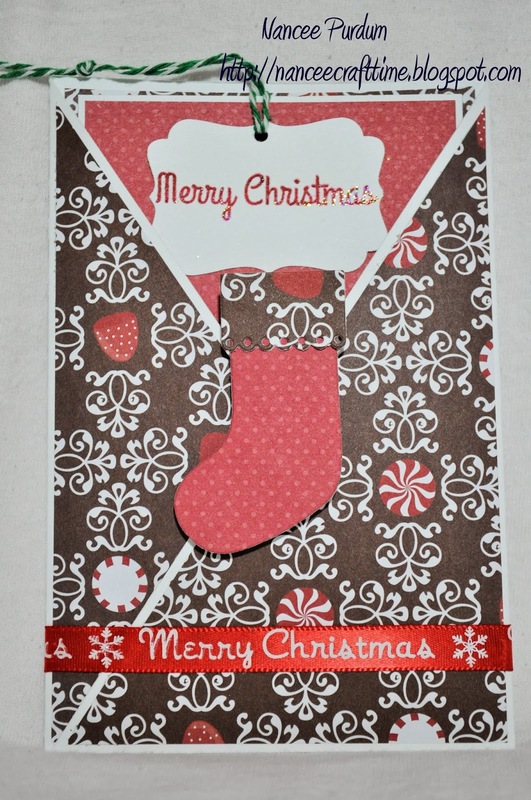 Adorable papers and designing and of course I love the MB stocking! I don't have that die! lol I've been wondering about that envelope board. I make mine with the MS scoreboard, so I've been waitin' to see on this one. Good to hear how it worked for you! TFS! This is completely adorable. The stocking is so cute an your do ha me thinking chocolate! I've just this weekend learned about SU envelop board! It looks fabulous and would take all the trial and error away! That's my kind of tool. I needed gift card holders at Christmas too but ended up buying some. I'm going to get a head start this year though and you've inspired me! Thanks!! Great gift card holders! Nicely designed. Oh wow, Nancee, these are wonderful! The paper on the stocking one is to die for! I love things like this! You should do a tutorial on how to make these. Happy New Year! Your persistence paid off. Your gift cards are delightful! Great job!